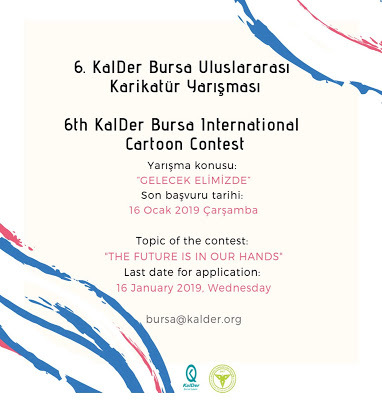 TheCaricatureContestwill be held with collaboration of KalDer Bursa Branch Officeand Anadolu Karikaturculer Dernegi (Anatolian Caricaturists Society) forthe 6th within the 17th Quality and Success Symposium which is going to take place in Bursa between 12th – 13th of April 2019. 1. Topic of theContest: "The Future Is In Our Hands"
The amazing developments in science and technology have changed human life, which was primitive up to a few centuries ago, quickly.Thousands of people who have different lifestyle made an effort to adapt to these changes.Societies have experienced various management systems in thecourse of time. Countries set up the order to exploit other countries. Asymmetric income distribution occurred. Modern slavery and consumer labor force began to destroy world resources. What will happen to people in thefutureif life goes like this? How will the future of the person who has difficulty accepting rapid changes be created? How do we make “human”the winner of all time? How will we criticize today to solve the human problems? In line with this context, we organize our competition with the subject "The Future Is In Our Hands"
3. The contest is receptive internationally for all amateur and professional caricaturists. 4. Application: Limited withthree (3) caricatures, may be e-mailedto bursa@kalder.org in 300 dpijpg format. 5. Thecaricatures can be published, yet should not be awarded in another competition. The caricatures will be published at www.facebook.com/kalder.bursa social media account between21.01.2019 - 31.01.2019 for detection of plagiarism and resemblance. Objections will not be considered after these dates. 6. Competing caricatures may be printedandused in KalDer organisations (posters, books, albums, postcards, brochures, invitations, exhibitions, etc.) and published in internet environment. One of the artworks may be used as the main visual of the 17th Quality and Success Symposium which will be held in Bursa between 12th to 13th of April 2019. All remaining publication rights belongs to the author. Competitors are considered to have an agreement in these conditions. Explanation: Reward money and plaques will be sent to respective winners in March 2019. Reward money will be paid according to exchange rates of thedate of payment in USD for international artists. 8. Results will be announced at www.facebook.com/kalder.bursa social media account on 09 February 2019, Saturday.